I didn't intend for this to become another Sunday Sermon; however, last night watching the latest edition of Bill Maher on HBO I could not remain silent....for God's sake! A pompous, yet brilliant, Richard Dawkins was being interviewed by the equally pompous, yet brilliant, Bill Maher about the absurdity of the belief in God. As Bill and Richard kept implying, those who can believe in a talking snake are basically "idiots". 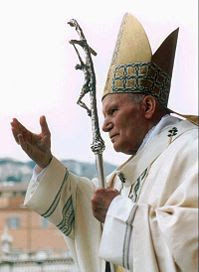 Thank God that we have Spiritual leaders like Pope John Paul II, who answered the deep questions that can divide us about Faith and Reason. You see, Faith and Reason are the two pillars that support the human race. Somehow in today's society it is implied that you can't be a Republican without being a numb skull, right wing, self-righteous fundamental Christian; you can't be a Democrat without being a gay loving, Hollywood producing, forgot my Jewish heritage, bleeding liberal moron; you can't be Muslim without being a crazy kill anybody without a turban, AK47 carrying, berka wearing, Koran thumbing fundamentalist; you can't be an intellectual without being an atheist, and you can't have faith in God or in Spirituality with a prestigious college degree. Yes, I agree, the idea of the Creationist and literal interpretation of the Bible drive me nuts. We have scientific evidence to prove evolution, but who is to say that God's hand is not in such an incredible display of power and life! We have the intellect to interpret the stories of the early Bible as they were meant to be, allegories about how humans related to each other, to themselves and to God. What is happening now is that both sides, the atheist and the fundamentalist, are using literal interpretation to prove the other wrong in an ironic clash of self-aware elitism. I believe that you can have faith with reason. Or, for that matter you can have faith without reason. You can also have reason without faith; and for those dangerous few, no faith and no reason; however, faith and reason are separate entities which should be used to support each other rather than destroy each other. I choose to be a supporter of faith and reason. I may not agree with all that a Creationist Evangelical degrees, but I do respect their faith. I only ask for the same respect, which seems reasonable to me. Yes, Adam and Eve were not this super mom and super dad of the human race, and evil incarnate didn't speak through a snake; however, the real story is not so much an ancient attempt of describing the human condition, but how we as humans have always had the desire to reach beyond ourselves towards the Divine. It's written on the walls of pre-historic caves in France, the hands on cliffs in Australia and in the wisdom of the tribal Shaman across the globe. Fight it, love it, hate it; whatever, it is a reality of not only faith, but reason. Besides, snakes do talk. Just ask the neighbor who loves to gossip, the unjust boss who tells you one thing and then says another, the intellectual who believes his brain and degrees make him superior to the simple man. We are mighty indeed when given the chance, but we will never by the All-Mighty. The sooner we all embrace this reason, the sooner our faith in the Divine Energy of Life, our fellow humans and the potential for our planet will be realized. Year ago, I was asked to step down from teaching Sunday School to high school age children because I said that I didn't believe that Noah actually built an arc and gathered animals two by two. I said it was more important to take away the lesson being taught. When I challenged the youth minister (who canned me) what he thought the lesson was, he couldn't tell me. He said something like, "All I know that if it's in the Bible IT'S A FACT!" It is only when I see God in everything, including, and perhaps especially the things I disagree with (or understand), do I see God at all. It's hard to see God in things we judge as evil. Yet, God is there -- unless it's a talking snake. But if you look every closely at that snake, there is God's fingerprints all over those scales. Thank you, Sir Hook, for this fine post. 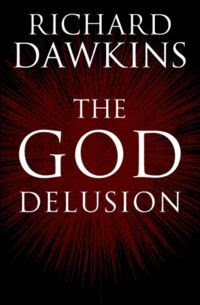 Professor Dawkins is simply brilliant, possibly one of the most lucid writers of our time... until he tackles religion of any sort. Then his m.o. is to paint all believers as unthinking fundamentalists, to mock rather than to engage in any real conversation, and to avoid any real debate with an intellectual equal. He erects straw-men and then easily dismisses them with that patented smirk of his. As for Mr. Maher he's not worthy to be mentioned in the same paragraph as Dr. Dawkins. Sad. I think there is a lot of evidence for adaptation, not macro-evolution. I don't think there is any real evidence for life beginning in some primordial soup. People shouldn't take Genesis literally - it is a series of moral tales. I believe all of the Bible with the exception of the Five Books of Moses were written strictly by humans and should be seen as that.